Explore the earthy, woody fragrance of the Black Pepper, Cashmere and Lemonwood Eau de Toilette from KORRES. Exuding character and masculinity, the EDT opens with fresh, fruity Lemon, Tangerine and Pineapple accords, before developing into striking Black Pepper and Cardamom in the heart. Settles on an opulent base of Cashmere, Patchouli and Cedarwood to create a rich, sensual scent that is perfect for any male. Top Notes: Lemon, Tangerine, Pineapple, Grapefruit. Heart Notes: Black Pepper, Cardamom, Lavender, Indian Gurjum. 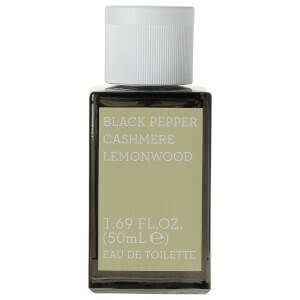 Base Notes: Cashmere, Patchouli, Cedarwood, Guaiac Wood.